Cooking note: Which oil ? – for Chinese cooking? | Cooking Simple Chinese food at Home Cooking Simple Chinese food at Home | Cooking note: Which oil ? – for Chinese cooking? Cooking note: Which oil ? – for Chinese cooking? I used to think soy oil was the most popular oil used in Chinese cooking, after all, it was the oil that I grew up with. However, after talking to my friends from different parts of China, I realized how narrow minded I was. Well, I did know that vegetable oil, groundnuts oil, sunflower oil can all be used for Chinese cooking; however, I grew up in the North East of China, where the land is especially well-suited for growing soy beans, and soy oil is often used in daily cooking. (My mum would say that it is also because of our Hui ethnic group origin that we used so soy oil so often). It is certainly true that among all these oils, soy oil is the one that probably has the strongest aromatic smell and taste. And I am used to that smell, and I like the food with that taste (of soy oil). It gives the dish — an enhancement in taste. But, of course, other oils are also good for stir-frying, and they are probably much cheaper. The only thing I would not recommend is (as I mentioned before) is that pre-prepared so called “stir-fry” oil. Although it is packed with ‘stir-frying seasonings’, it is not suitable for all kinds vegetables or meat (not to mention the price is not really worth it), rather you can adapt different flavors by simply altering the amount of seasonings, or garlic, ginger, etc. The way in which oil is used for cooking is also very important. Although most kinds of oil sold in the markets here in England can be used directly into cooking, frying, making salad, and so on, soy oil in northeastern China is normally sold ‘raw’ (at least most of the times). 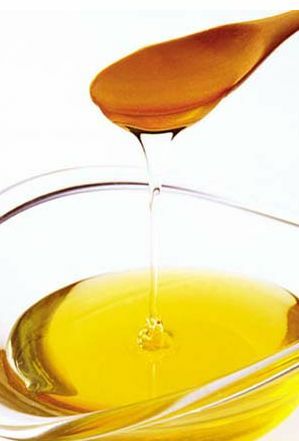 It may sound strange, but there is a clear difference between ‘raw’ (sheng you) and ‘cooked’ oil (shou you). ‘Raw’ oil normally does not have that rich aromatic taste yet. I remember when my parents used to buy oil back home, they would always ‘heat’ it up first, then use it for daily cooking as usual. It is called “cooked” oil (Shou/Shu You in Chinese, “You” means oil). Saying ‘heating’ the oil up, actually my dad would fry something, for example, peanuts, instead of just ‘cooking’ them plainly, afterwards, the oil is filtered, and kept for the future cooking. ‘Cooked’ oil then can be used for stir frying, salad, making chilli oil, or improving the ‘appearance’ of the dish. Talking about the looks of the dishes may sound a bit strange… A dish is normally considered ‘good-looking’ if the surface of the food is a bit “shiny”, and the usual way to achieve this is by using oil. Despite having been in contact with oil during cooking, food normally loses that ‘smooth glow’ after it is done, so the chef would normally dip the cooking turner into the oil, then stir the food, or add a few drops of oil into the wok, right after cooking, and before serving the food on a plate. — This oil has to be ‘cooked’ oil. — Well, but normally I don’t want to put extra oil in the dish for home cooking, you can see from my recipes, unless we have guests, and I have to make effort to make a good ‘representation’. I don’t usually re-use the oil. However, the other day, after making ‘You Tiao’, there was too much oil left in the wok, I did not want to throw it away. My mother-in-law told me that oil can be ‘re-used’ one more time, so I used the left-over oil for stir frying dishes. Surprisingly, although I didn’t vary my cooking methods, the dishes turned out very tasty — in the end, I realized that it was because of the oil. It was only just vegetable oil, but it had a much richer flavor.